I read through the Reporing Bugs Community Wiki. I am unsure exactly what kind of package to report my bug against. The problem is that my USB sound device will only work if connected at boot, but not if I plug it in after. So, is it a USB bug, a sound bug, or a boot problem? I don't know. The only USB option is for storage devices, and I'm not sure if it's a sound problem or USB problem or what, so I go with "Other problem". But then I'm simply dismissed with a "No package specified" error. How was I supposed to specify a package when the reason I chose "Other problem" was because I'm not sure what's going on? ... but wait... Pulse hadn't crashed before I started the bug reporting process, so is it the bug reporting process itself that crashed Pulse, and if so, then isn't that separate from the bug I want to report? At this point I've lost confidence in the bug reporting procedure. 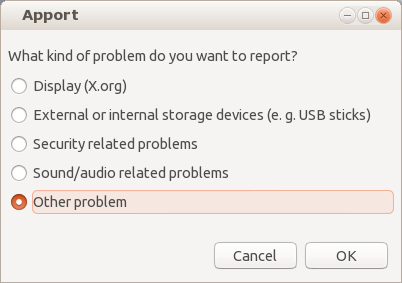 This is not the first time I have encountered the incredibly user-unfriendly Ubuntu bug reporting process, so I could go off on a rant about it. But I won't. What I really want is just to be able to plug my USB audio device in after booting and not think about Ubuntu bug policies and politics. So... how can I report this bug without getting stonewalled and diverted? To report the pulseaudio crash, open page https://bugs.launchpad.net/ubuntu/+source/pulseaudio with a web browser, click "Report a bug" and follow the directions. To report the problem of the USB sound device being detected at boot but not at a later time, do the same but with the udev package: https://bugs.launchpad.net/ubuntu/+source/udev. If it turns out that another package is responsible for the malfunction then the report can always be reassigned. Not the answer you're looking for? Browse other questions tagged launchpad ubuntu-bug or ask your own question. Why am I frequently getting this “Cannot allocate memory” error? How does one find a kernel commit from a launchpad bug report? Submitting a Bug on Launchpad when there are Missing Debug Packages?